SpaceX is poised to launch its first recycled rocket on Thursday, using a booster that sent food and supplies to the astronauts living at the International Space Station in April. The goal of the launch, scheduled for 6:27 pm (2227 GMT) from Cape Canaveral, Florida, is to send a communications satellite for Luxembourg-based company SES into a distant orbit. The weather forecast was 80 percent favorable for launch, officials said. Standing upright at the NASA launchpad, the white Falcon 9 rocket contains a tall, columnar portion known as the first stage, or booster, that propelled the unmanned Dragon cargo ship to space last year, then returned to an upright landing on an ocean platform. 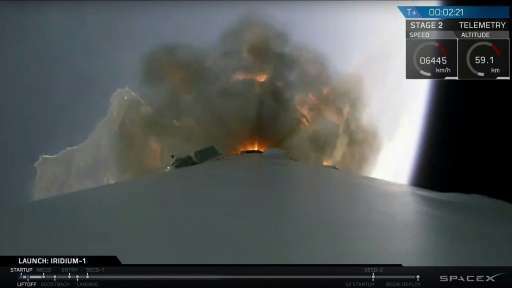 SpaceX, the California-based company headed by visionary entrepreneur Elon Musk, has for years been honing the technology of powering its boosters back to careful Earth landings on solid ground and in the water. So far it has successfully landed eight—five on so-called "drone ships" floating in the ocean, and three on land. The goal, Musk has said, is to make rocket parts just as reusable as cars, planes or bicycles. Currently, millions of dollars' worth of rocket parts are jettisoned after each launch. 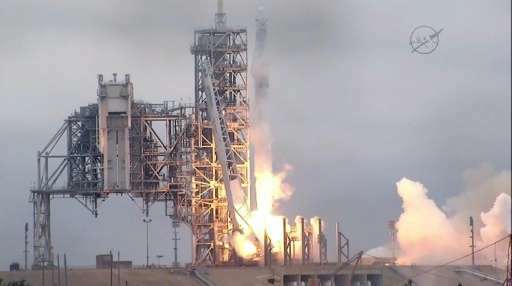 SpaceX officials have said that reusing hardware could slash costs—with each Falcon 9 launch costing over $61 million—by about 30 percent. While generating plenty of buzz, the novel process still raises concerns for both customers and SpaceX. They include "worries about it failing, insurance implications, retrofitting turnaround, building up a critical mass of reused first stages in the warehouse," said the global investment banking firm Jefferies International in an April report. "But the direction of travel is clear." SpaceX competitor Blue Origin, run by Amazon.com founder Jeff Bezos, has also successfully landed its New Shepard booster after launch, by powering its engines to guide it down for a controlled, upright landing. "Reusability allows us to fly the system again and again," said a statement on Blue Origin's website. "With each flight, we'll continuously improve the affordability of space exploration and research, opening space for all." As for the cost of Thursday's launch, Martin Halliwell, chief technology officer at SES, has declined to say publicly the exact amount. However, he dismissed "naysayers" this week and stressed the historic nature of the launch on what he has described as a "flight-proven" rocket. "I think we are on the edge of quite a significant bit of history here," he told a news conference. "Now we are here to be the first-ever mission to fly on a pre-flown booster," he said. "This is obviously hugely exciting." When the mission was announced in August, Halliwell said the deal "illustrates the faith we have in (SpaceX's) technical and operational expertise." The SES-10 satellite will be sent to a geostationary orbit, flying as high as 22,000 miles (35,000 kilometers) above Earth before maneuvering into its designated orbit. The satellite aims to expand television, internet and mobile connections across Latin America.